Daimler CEO Zetsche says a product offensive will provide a tailwind for the company's sales and profitability goals. STUTTGART – Daimler CEO Dieter Zetsche is determined to push Mercedes-Benz back to the leading position among premium automakers. "Our goal is to be No. 1 in profitability and sales in the premium segment. The objective is clear, and so is our commitment. Concrete measures are next. 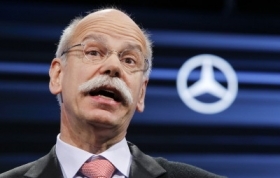 We will talk more precisely about our milestones later," Zetsche told Automotive News Europe. After Mercedes recently launched a new marketing offensive with the slogan "The best or Nothing," Zetsche said the next step is to follow up with clear volume targets. The CEO forecasts a significant sales increase in 2011, compared with last year. "This year, we expect sales of more than 1.35 million for Mercedes Benz Cars," he said. In 2010, the company sold 1.17 million cars. Zetsche also reckons with increasing sales for the company's Smart microcar brand. "Last year, the figure was 97,500 Smarts. In 2011, we are aiming for 100, 000," he said. Daimler has announced its goal to sell 1.5 million Mercedes cars by 2015. Audi has said it wants to reach the same volume a year earlier, in 2014. Zetsche believes Mercedes will beat Audi in volume sales. "In recent years, we invariably sold fewer vehicles than Audi in the first four months of the year. This year, this was the case for six months. But we were still ahead for all of 2010. It is certainly a bit tighter this year. But I am confident." Zetsche said Daimler will not lower profit goals for Mercedes. "Even before the economic crisis of 2008, we set a profit margin of 10 percent as our goal at Mercedes-Benz Cars, as part of our Go for 10 program. This still applies," he said. Asked whether Daimler could reach a return on capital of 21 percent, as some competitors have targeted, Zetsche said: "Besides targets for our automotive fields, we have set strategic goals internally for capital turnover. Target figures for return on capital are inherently derived from the product of the two figures. Our figures are higher than the one mentioned. " Zetsche said the company's product offensive will provide a tailwind for the company's sales and profitability goals. "By 2020, we will bring out at least 10 complementary models, like the new compact and the CLS Shooting Break. This may happen even faster. We still have a few ideas for new models. We will use them to close gaps and forge ahead into completely new segments. We will employ these new building blocks in our attack." Currently, Mercedes has 22 models. Audi has 21 and BMW 19. Daimler's industrial partnership with Renault is bearing fruit in the area of light commercial vehicles. In 2012, Mercedes will launch a model based on the Renault Kangoo. Said Zetsche: "That is a very interesting project. A small city delivery vehicle, primarily for commercial use, is being developed on this basis. It is being optimized for longevity, quality and appearance and is closing a gap in our light commercial vehicle product line." Daimler will also boost its headcount. "This year, we will make more than 10,000 new hires globally, 4,000 of them in Germany," Zetsche said. At the end of 2010, Daimler had 260,000 employees worldwide. The figure was 164,000 in Germany. Zetsche said the automaker may boost production capacity in China. "In 2015, we expect sales of more than 300,000 units in China, of which two-thirds, or 200,000, will be produced locally. We are continually in growth mode. But we can't talk about the next steps today. One thing is clear: In China, there are more than 120 billionaires and about 670,000 millionaires. Until they are all driving the S class, we still have things to do." Zetsche said Daimler will not seek to incorporate a high-volume brand once again, as his predecessor Juergen Schrempp tried to do with Chrysler and Mitsubishi. "We are a premium manufacturer. On specific issues, where volume plays a major role, cooperative projects like the one with Renault are a good solution. We do not plan to become involved in the high-volume segment ourselves."